Hosting Center Review 2019: Is Hosting Center a Good Hosting? For cheap shared web hosting, VPS rental, dedicated server rental as well as colocated servers and 1C-Bitrix environments, Hosting Center is an experienced and reliable hosting provider based in Russia. Hosting Center was founded in 2002, making them a very experienced Russian web hosting company. They now have over 240,000 customers from around the world making use of their shared web hosting, VPS, dedicated server, and colocation services. Their Tier III data centers are located in Russia, France, and the U.S., providing a global reach. Their web hosting plans are pretty standard with nothing that really stands out. 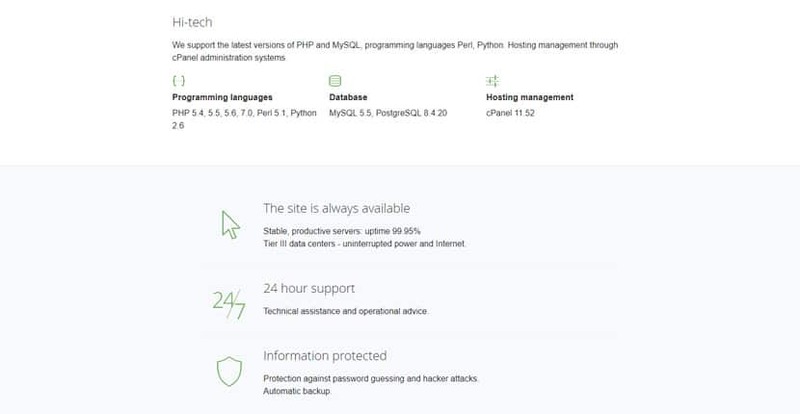 However, they do come with a cPanel license, which will allow you to install almost any CMS or script via Softaculous. Their VPS products come with high-bandwidth connections of 100 Mbps and support IPv4 and IPv6 addresses. They also run on SSD storage for better performance than standard hosting. One notable aspect of Hosting Center is their 1C-Bitrix VPS hosting, which allows you to run this web environment for your business applications and is a unique service offered almost exclusively by them. Hosting Center’s dedicated servers are housed in world-class Tier III data centers with the TIA-942 standard, ensuring high availability and reliability. You can choose between a number of Linux or Windows distributions and the ISPmanager Lite control panel. You also get IPMI remote control of your server through a web interface with BIOS access. Additionally, if their RAID 1 redundancy with multiple backup drives isn’t enough, you can also add on FTP backups. Hosting Center offers a relatively straightforward range of shared web, VPS, and dedicated server hosting. Although they don’t offer any blanket money back guarantees, you can test out one of their web hosting plans for 14 days on a trial basis. All their plans come with monthly, quarterly (except for dedicated and colocated servers), semi-annual, and annual billing with discounted rates for longer periods. They also offer unlimited traffic across the board. Pricing starts at very affordable rates. Hosting Center provides 24/7 expert technical support with all of their products and plans. While you can reach them via a local Russian and international phone line, they mostly provide technical support via a ticketing system. The customer support staff isn’t always the friendliest or most attentive, but they usually get the job done regardless. They also have a fairly extensive help section with articles answering the most common questions asked. Hosting Center provides a solid range of shared web, VPS, and dedicated server packages. With their strategically located data centers, you can also take advantage of their services by choosing the optimal server-to-market location for you. Data centers in Russia, France, and the U.S. Wondering how Hosting Center stacks up against other Web Hosting companies? Enter any other Web Hosting company and we will give you a side-by-side comparison.